How then should you love your neighbor? From last week’s post (Who is my neighbor? 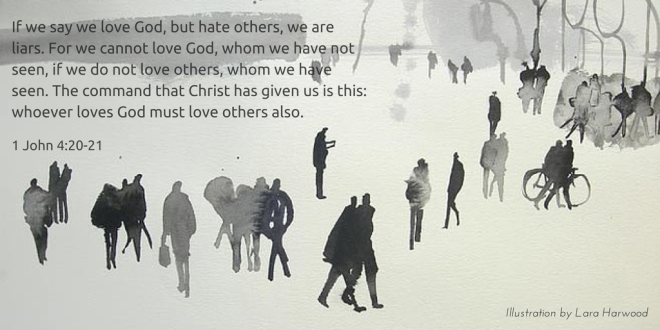 ), let’s now take a look at how then we should love our neighbors. Last time, we were able to identify our neighbor in the commandment, “love your neighbor as you love yourself”. In this post, let us take a look at the weight of love that we ought to give our neighbors by looking again to the very words of Jesus. 9 “As the Father has loved me, so have I loved you. Now remain in my love.10 If you keep my commands, you will remain in my love, just as I have kept my Father’s commands and remain in his love.11 I have told you this so that my joy may be in you and that your joy may be complete.12 My command is this: Love each other as I have loved you.13 Greater love has no one than this: to lay down one’s life for one’s friends.14 You are my friends if you do what I command. “Love your neighbor as yourself”…so who is my neighbor? act from it and how else can we show our obedience by practically applying it in our lives. I must admit, the insights I would share with you in this post are triggered by my partner in our Praise and Worship Team (Jake, who I know is just out there, reading some materials about humanity/theology/music/anything under the sun). Jake is currently studying in a seminary and taking up Theology. He’s very passionate about learning Christ’s life here on earth, his connection with humanity and society, and how we ought to live like him.